Ta Mara Conde has been conserving and restoring historic grave stones since 1998, beginning as an apprentice with Fred Oakly who was the head of conservation for the Association of Gravestone Studies (AGS). She continued studying conservation techniques through several institutions including AGS, the National Parks Service and Cathedral Stone Products Certification Program. 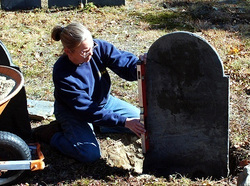 Ta Mara has taught conservation workshops through Greenfield Community College and continues to use hands-on workshops to educate cemetery employees and the public about proper conservation techniques across the US and Canada. Cone Hill and Center Cemeteries in Richmond, MA, Woodlawn Cemetery in Nashua, NH, Center and Pine Grove Cemeteries in Templeton, MA, Vale Cemetery in Schenectady, NY, Liberty Street Cemetery in Granville, Ohio and Salem Street Cemetery, Medford, MA. Ta Mara started Historic Gravestone Services (HGS) in 2007 to provide professional restoration services for grave markers, monuments, sculpture and other historic stone works using historically accurate materials and standard artifact conservation techniques. HGS abides by the American Institute of Conservation’s code of ethics and follows the Secretary of the Interior’s standards for monument conservation.